Powerful digital images are created by thought, understanding, tools, hardware, software and services. 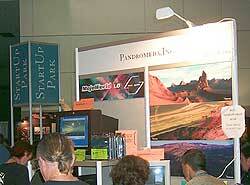 Siggraph 2001 had over 75 categories of products and services on display that help people create their digital images worldwide. There were 303 companies which exhibited at Siggraph 2001. I have included some of them that caught my attention. In light of the current economic downturn, many people were debating show attendance numbers and how many companies would be attending, as influenced by recent job layoffs, company shutdowns and industry consolidations. However, some companies such as the Digital Domain, Rhythm and Hues, Angel Studios, Boris FX, Lucas Arts Entertainment, Nintendo and others were talking to job candidates. Some attendees told me they spent their limited funds to travel to LA to try and keep pace with the rapid technological changes, improve their skills, get inspiration from the conference and other attendees and to be part of "new future possibilities". On the business side, some firms related that they painfully learned the technology and support industries were not immune to economic and business cycles. A few expressed the feeling that the dot coms should have used better business strategies and practices and spent their operating capital more wisely. 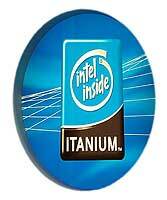 Others noted companies such as NVIDIA and ATI were growing fast and the inevitable consolidations of smaller companies will continue. The gaming and entertainment sectors look good and might help lead some of the tech companies out of the economic slowdown, through new digital innovation like that being shown at this conference. A local company said "Siggraph is now back in Los Angeles -- I'm glad and I'm ready to make some money". The 3D Hardcopy conference explored how the traditional 2D computer graphics industry is utilizing the latest 3D rendered virtual images to morph into physical 3D physical models, using the latest in 3D Rapid Prototyping technologies. Case studies, comparison of different processes, interchange issues were among the discussed topics. Real world examples of the objects and processes were also shown. 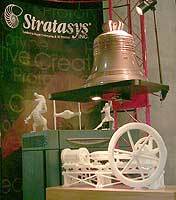 I particularly liked the aviation-based physical models and complex artistic shapes being displayed by Stratasys Inc. This Minnesota-based company creates 3D models from CAD drawings using its rapid prototyping systems (RPS) and 3D printers. 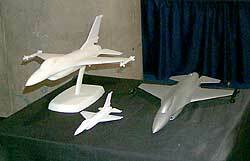 The jet aircraft models were finely finished using RPS plastic and one received a silver coating that made it look as if it had been machined out of an aluminum block. The artistic models were quite intricate and detailed. During the exhibit show hours, new examples were being created by many RPS companies to demonstrate the speed of their RPS systems. Eyetronics, Gentle Giant Studios, Minolta, Polhemus and 3D Systems were also demonstrating their 3D rapid prototyping capabilities. Simulating nature is a newly emerging trend at the Siggraph. Several conference sessions were discussing fractal-based techniques for simulating mountains and even interactive navigable planets. The simulation of water, clouds, smoke and plants have all had their own challenges, but much progress has been accomplished through the work of Purdue, Stanford and Calgary (Canada) University. Companies such as Pandromeda and Cinesite are bringing this technology to the marketplace. 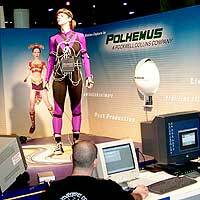 Polhemus, Inc. demonstrated human 3D motion tracking and capture and scanning solutions. Colorfully clad wired dancers were not only motion-captured , but captured attendee attention as well. For me, the combination of Art and Technology was best represented by the NTT Network Innovation Laboratories exhibit. Inspired by Mt. Fuji and a masterpiece 1831 Hokusai wood block art print of the mountain, bathed in the reddish glow of the setting sun, the researchers and scientists are trying to scale the new heights of digital cinema technology. They wish to contribute to the broad advancement of society, industry and the arts through their "Scaling The Heights Of Digital Cinema" initiative. Their goal is to create a new kind of soft network, able to respond flexibly to changes in traffic and services. These soft networks can evolve into the sorts of adaptive networks that NTT believes will play a key role in building the next generation photonic Internet. The concept of SHD digital still imaging was proven over the last decade. Images shown in the NTT exhibit space were superb and showed fine art works digitally with great detail and clarity. As recently as February, 2001 the Digital Cinema Consortium (DCC) was established to promote the development, testing, evaluation and standardization of very high quality digital cinema formats and related infrastructure. Members include representatives from Japan's leading universities, equipment manufacturers, network providers and motion picture industry. Siggraph 2001 is the first public showing of the new proposed high performance standard for the next generation digital cinema ---2Kp/24. This new format is defined as 2000 or more scan lines, progressively scanned, running at 24 frames per second. It features RGB color encoding, 24 bits per pixel, sampled at 4:4:4, for a much more film-like visual richness. In the current system, I feel the images are excellent, but seem to be pushing the practical limits of today's most advanced digital display technology. Wider screen aspect ratios are needed and interoperability with existing and future international standards must be assured to achieve business viability. NTT feels this process will open new theatrical audiences to computer animation and synthetic movies at very high resolutions. Ongoing 35mm film production, as well as large scale digitizing of the global film archives could continue to be rich sources of potential 2Kp/24 content, until digital cameras supporting this new format appear. In summary, the 2Kp/24 digital cinema production process would start with films shot and edited in 35mm, then scanned digitally and compressed from a base bandwidth of 4.5 gigabits per second to 300 Megabits per second, able to be sent over Gigabit Ethernet. This bitstream can be played back from a local disk, decoded in real-time and fed to an advanced, super high definition 2Kp/24 digital projector. The result would be stunning images. On the business side, to be viable there would have to be rapidly expanding digital acquisition, editing and distribution systems that make compelling economic advantages. Strong supporters like George Lucas and Hollywood will help. Stay tuned for developments. The conference presenters spoke about how HDTV cameras and recorders are now beginning to capture images at the rate of 24 frames per second instead of the television 30 frames per second. Electronic projection systems now match the brightness and wide-screen resolution of cinema, without any film scratches or jitter. Representatives from Industrial Light and Magic, The Walt Disney Company and Texas Instruments spoke at length about the present and the future of this new medium. It is clear that all groups will have to fully discuss and understand how all this technology will work in the real world. This is essential if they are to successfully scale the "Top of the Global Media Mountain" in cinema, consumer's homes and transportation systems. The consumer will ultimately have to pay for all this and they will have the last word. As noted earlier, Protrude, Flow 2001 is an artistic stand-out. This outstanding and surprising work was located in the interactive art installation area. Other noteworthy works of art included traditional wall hung images, sculptures and live performances. Chaotic Robotic Synesthesia explored sense sharing. The music is propelled by mixing colors and sharing frequencies. This artwork attempts to forge tactile, aural, and visual perception between humans, in collaboration with technology, to yield better ways of understanding, seeing and hearing the natural order. Sony Pictures Imagineworks, Inc. sponsored drawing competitions and instruction on tee shirts even with life drawing models. Numerous artists took part over the three days. The games keep ramping up and evolving while new technologies are being created. OpenML is "the new kid on the block". OpenML is a new industry effort to develop a standard, cross-platform, environment that supports creation and display of all digital media, including audio, video and graphics. A key goal of this effort is to define standard synchronization primitives, which will ensure efficient, accurate, and synchronized delivery of independent digital media streams. This first rate panel session included members of 3DLabs, Discreet, SGI and Intel who provided further information and background on this new movement. 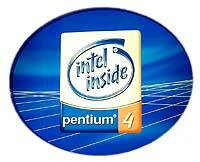 Intel had a modern and flashy display that pushed all their latest chips and partners' solutions, but the Pentium 3 still carries the heavy sales volume. The next round of big price reductions scheduled at the end of August may change this. AMD is already talking about 2 gigahertz chips. NVIDIA showed off its Quadro2GO mobile "workstation in a laptop" that was eminently portable and powerful. Attendee interest was strong. NVIDIA seems to be building its holdings and increasing its revenues. 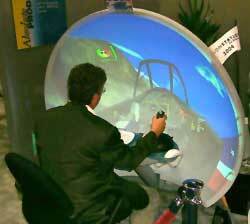 The Visionstation from Elumens Corporation uses a hemispherical display whose dimensions are 63x65x41 inches (HxWxD) and weighs about 90 pounds. These units were seen throughout the show. Games, training, simulations, collaboration and product presentations were among the applications. While not designed for home gamers, the stylish and practical units are said to be affordable, low maintenance and easy to use for business and government organizations. Larger sizes are available in 3, 4, and 5 meter size. The aircraft simulations looked more realistic on this equipment. Perfect for your arcade room at home. Computer Graphics, coupled with powerful computers in large scale, immersive theaters are revolutionizing planetaria and dome theatres worldwide. SGI and Sun Microsystems are big players in this sector and were both here at Siggraph. (Also read about the Evan and Sutherland's Star Rider theater launch at the Adler Planetarium in Chicago which uses similar technology.) By using multiple, edge-blended video projectors, these systems can project ultra-wide, high-resolution images onto overhead domed screens. This provides new meaning and feeling to virtual reality. In the conferences, industry leaders from the American Museum of Natural History, Princeton University, the Exploration Place and Spitz, Inc. provided insights into the theory, practice and implementation perspectives within this cutting edge field. On the exhibit floor, SGI showcased its 02 workstations and Origin family servers, as the workhorses behind the summer's biggest blockbusters such as The Mummy Returns, Pearl Harbor, AI, Jurassic Park III and Planet of the Apes. 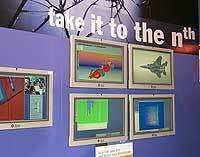 Images were shown on impressive Reality Center walls, room size displays and desktop devices. Many industry applications of virtual reality were displayed or discussed. Energy, science, education, planetariums, science centers, museums, defense and business intelligence rounded out other applications of this technology. Immersive visualization creates panoramic views and assists virtual pilots during practice to help improve their decision making capabilities. I thought the images and speed of rendering looked quite realistic. Sun Microsystems had the largest exhibit area in the main hall. Sun and its partners demonstrated applications from high end systems focused on molecular biology with the University of Illinois to performing high end fabric printing with industrial Xerox color printers. Some of the results of the biology simulations were displayed on latest 24 inch LCD Monitors. Multiple Sun UltraSPARC Blade 4800 Workstations and a powerful Sunblade 1000 Serverfarm were used at the booth. Sun's theme at the show this year was "Take it to the nth". The LCD monitors were only 3 inches thick and displayed 2.3 million pixels at an incredible 1920 x 1200 resolution with a 170 degree viewing angle. The colors were brilliant and clarity was outstanding. In spite of the dot bomb situation, the Web is not dead. Already group discussions are centering around interactive entertainment experiences using instant messaging devices. New horizons for Internet appliances that are receiving some buzz are narrated game stories and simulation to increase the addiction level, in hopes of creating a sustainable revenue stream. In Start-Up Park, Pandromeda, Inc. displayed some high quality panoramic images of landscapes, buildings and interiors. Ease of use and cost effectiveness were two of their key selling points. Huge Systems Inc. serves up one terabyte of desk top storage in an HDTV RAID form, for under $10,000 a system. They use compact reliable Maxtor one gig HD drives in groupings that can be configured to the end users' requirements.